Routinely, schools are blamed for failing to prepare students properly for the world of work, and for not instilling the skills and values that employers want – as if command of the three Rs, a tidy haircut and a willingness to work will still deliver a job that pays well enough to sustain a middle class standard of living. Dream on. In reality, it is a buyers market out there in all but the most skilled categories of labour. Much gets made of the so-called NEETS – those ‘not in employment, education or training’ – but for young would-be workers, problems exist at virtually every level of the jobs market. More graduates = fewer openings. A university degree or its equivalent is now regarded as an essential ticket to the middle class and beyond – at the very same time that many of the middle class jobs that used to sustain this personal and public investment in education are fast disappearing, particularly from within the public service. For many people aged 18-29, the resulting sense of being sidelined – or kept in a holding pattern – feels the same, among the un-educated and over-educated alike. And it may be about to get worse. This year, there have been political signals that the interest-free student loans that have done a lot to keep university education within reach of the sons and daughters of the middle class, are under threat – if not this election year, then during the current government’s second term. What it amounts to is a supply and demand bottleneck. Evidence of excellence at higher education is deemed ever more essential, even as the pay-off for it becomes ever more uncertain and conditional. In sum – despite the cost and effort involved in getting a university degree, many twentysomethings are finding the investment that they (and their parents) have made in tertiary education isn’t necessarily paying off with a commensurate job, let alone with a substantial wage and a career path. “We can’t get to where we want to go,” Krugman warns, “just by giving workers college degrees, which may be no more than tickets to jobs that don’t exist, or that don’t pay middle-class wages. “ Worryingly, almost all the policy options in favour – tax cuts, reduced state spending, de-regulation and de-unionisation, contracting out to the private sector and/or outsourcing overseas – are to do with further reducing labour and its costs, in the medium term at least. the number of New Zealanders with no qualifications fell substantially between 1986 and 2009 by 30%. Over the same period, those with only a school qualification or with vocational training credentials rose by 36% and 38% respectively. In sheer numbers, each of these categories – the totally unqualified the school qualified and the vocationally trained – still outnumber those with a university degree, but university is where the big change has occurred, albeit from a low base. [Between 1986 and 2009] the numbers of Kiwis with a degree increased from 100,000 to 538,000, a 437% increase This is particularly meaningful, given that the size of New Zealand’s working aged population (15+ years) increased over the period. The rate of growth in people holding degrees or higher qualifications shows the new social trend in New Zealand for relatively well educated people is to continue on and get a degree where (prior to the 1990s) getting a degree was less common. That trend poses a genuine challenge to any government faced with meeting the expectations arising from this personal investment of time and money – not to mention justifying the state’s own multi-billion annual stake in tertiary education. In the developed world and across North Africa and the Middle East, the inability (and ideologically-driven reluctance) of governments to embrace policies that meet the job expectations of the educated young is having socially explosive effects. That hasn’t happened here yet – but this article does try to describe a few features of the current landscape of youth joblessness and under-employment. 1. The Politics of Diversion. In an election year, the government would probably prefer to talk about anything but the economy’s failure to provide a viable working future for many under 25 year olds. (Not many young people vote, but their worried parents and grandparents do.) This may serve to explain why the plight of the long-term unemployed has been pushed to the fore as the centrepiece of welfare reform, and a cause for public concern. Relatively speaking, it isn’t a major problem – and yet for that reason, it makes a striking contrast with how youth unemployment is being virtually ignored. For nearly a decade, New Zealand has excelled in OECD comparisons about the management of long-term unemployment. In fact on the currently published data, New Zealand ranks a stunning 4th among OECD countries for success on this issue as measured by the usual OECD method of taking those out of work for a year or more, as a percentage of the total unemployed. The relevant table can be found by scrolling down to page 153 in the OECD yearbook here. Since these figures measure the situation in 2009, there has been some deterioration since then in New Zealand – and elsewhere – thanks to the global recession. Essentially, what these figures reflect are the relatively successful welfare and employment policies followed by New Zealand during the economic boom of the early to mid 2000s. As the OECD commentary said of this New Zealand success story: “ Since 1998, the share of long term unemployed has more than halved in New Zealand….” Even if one takes the ratio that the long-term unemployed comprise of the total civilian labour force, New Zealand is still in a better situation than the majority of the OECD, in that since 2003, we have been among the five nations with the lowest rates of long-term unemployment. 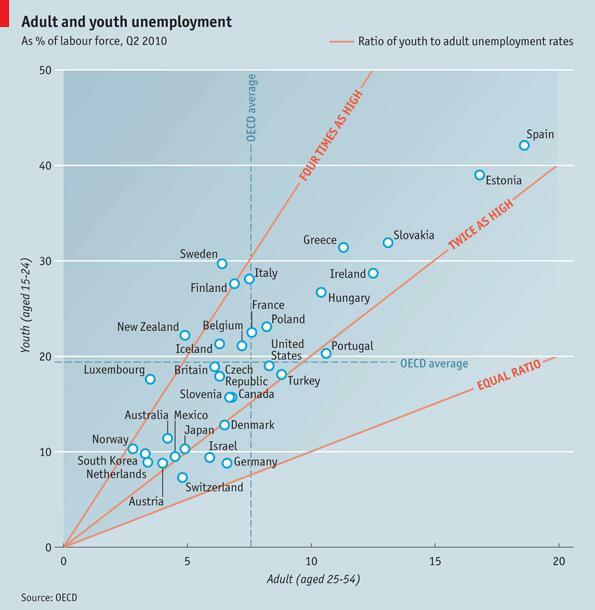 In stark contrast, we fare badly in the same OECD comparisons when it comes to youth unemployment. In New Zealand the young have been four times more likely than adults to be unemployed, a ratio well above the OECD average. The evidence is here. 2. Forecasting the Problem, and Solutions. Thanks to the resilient economies of Australia and China and favourable terms of trade, New Zealand has been sheltered from the full blast of the global recession’s impact on employment. Our official unemployment rate is still currently just below 7%, almost two points below the OECD average – and late last year, our official youth unemployment rate stood at 16.8 %, again slightly lower than an OECD average (18.5%) that has been artificially boosted by the 40% levels in member countries such as Spain. Even the experts can be fooled by the data. Earlier this year for instance, the International Labour Organisation told Business Week magazine how it thought it had detected a glimmer of light during 2010 in the global recession, after it discovered the numbers of unemployed people aged 15-24 had fallen by two million, across 56 countries surveyed. To be fair, not every indicator here is tracking south. Over the whole of 2010, youth employment rose by 5,400. Yet clearly, this barely put a dent in the youth unemployment figures. Neither did schemes such as Community Max, which – even if judged purely by its good intentions – is a small scale regional pilot programme response to a major problem, nationwide. What we know from the December 2010 MSD statistics is that nearly a third (32.2%) of those receiving the dole were aged 18-24 years of age, up from 27.5% in 2005. The young people hired during the boom mid-decade were the first to be let go once the recession started biting on employment. Young people have been growing in numbers over much of the last decade as have older people. 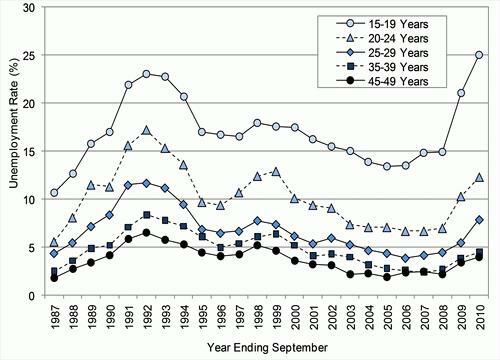 While the growth of those aged 15-19 is now slowing, those in the 20-29 age groups will continue to grow for some time. This ‘baby blip’ is arriving at both the labour market and tertiary education, including industry training, as the doors are closing on them. Otago Polytechnic officials have warned that if enrolment trends continue, the polytechnic could have at least 300 equivalent full-time student places (efts) more than was allowed this year. Given high youth unemployment in Dunedin and Otago, it was “no surprise we’re facing such a high demand”. Polytechnic board chairwoman Kathy Grant and [Polytechnic chief executive Phil] Ker said in later interviews that the student roll issue – with its prospect of limiting training opportunities – was not one for the polytechnic alone, but for the wider community, given high youth unemployment in the city and the desirability of people gaining further training. If the polytechnic could not secure additional places, it faced slashing its enrolment quota for the second semester by 40%, Mr Ker said. Young people don’t have the experience to relate to employers, they don’t have the job experience to go with the job skills they might have on paper. In the short run all [education] does is give people something productive to do if there aren’t jobs around. Now, if we opened up more of our tertiary education institutions, if we encouraged employers to take on industry trainees, even if there wasn’t a full job ready for them to go to….then obviously we would get more people in productive activity even if it wasn’t in work.. The capping of tertiary education at a time of recession is far too tight a response. A minimum wage increase to $13.50 was estimated by the Labour Department to cost between 480-640 jobs – but it would also have put an extra $76 million into the pockets of low income families – thus creating an average gain of roughly $136,000 for every $27,000 a year job that would have been lost. 4. Planning in the Rearview Mirror As mentioned, it is easy to blame the entire problem of youth unemployment on the ‘failure’ of the education system to teach what the market demands. Far wider economic forces are at work. Early last year, the Industry Training Federation tabulated some of the more glaring mismatches between qualifications and skills. In the sports, fitness and recreation field the ITF argues, while only 20,000 people are employed in the sector, some 4,800 people finished a related qualification in 2008, about 2,000 above requirements for the jobs available. Ditto with the highly fickle area of travel and tour services, which employs roughly 8,000 people – but where 2,000 people completed qualifications in 2008, four times that projected as necessary to meet future demand. Conversely, the ITF argued, too few are qualifying in the field of food manufacturing – where the country needs eight times more than the current levels of people who were qualifying in 2008, in that sector. In the boom years of the mid 2000s, funding incentives existed for teaching institutions to simply chase enrollments – rather than worry about how, where and whether their graduates would find an opening in the job market afterwards. Some of the more blatant mismatches has now been at least partly addressed – first by the regional facilitation efforts ( begun mid-decade) to better co-ordinate training with employment, and more recently by the brutal winnowing process of the recession itself. As the ITF figures suggest, there is still plenty of room for improvement. Even so, there are always plenty of advocates for making more resources available in the way of traditional vocational training for the less academically inclined – the ones who are currently being left behind at high school. (Lets assume any vocational streaming this may well entails can somehow avoid the past evils of prematurely pigeon-holing pupils at secondary school.) Yet it is still unclear how the subsequent jobs – not to mention job security – will emerge, once downsizing, outsourcing and foreign competition have taken their toll of those occupations. Recent history indicates that the vocational training destinations in traditional areas – such as manufacturing, construction and agriculture – have been where some of the heaviest hits from the past two decades of restructuring have taken place. Even at best, those sectors experience roller coaster swings in demand. Commonly, Australia serves as our safety net for skilled trades workers when demand slows down here. For that reason, New Zealand will struggle to retain and reclaim the skilled workers it will need to rebuild Christchurch, given the prior cutbacks in apprenticeships, and the enduring recession here. By next year, the birds may have flown away to help rebuild Queensland after the floods. As jobs in the old ‘vocational’ trades areas have declined and/or marked time, there has been a corresponding growth in the ‘soft service’ areas, which – broadly defined – now provides an estimated 60% of New Zealand employment. Some of these service jobs do offer university graduates fairly reasonable wages and a career path – yet many other service jobs, especially in the accommodation, hospitality and retail sectors offer poor wages, and no security. These patterns from the recent past are all that young students and their parents have to go by when choosing career training, but it is dangerous to assume that recent trends will remain the norm. Krugman points to evidence that technology will soon be doing far more damage to skilled office jobs than to the blue collar jobs that we tend to regard as the usual victims of automation. As the New York Times recently pointed out, intelligent software is already replacing many of the bread and butter jobs of engineers, law clerks, tax accountants, and chip designers – and wiping out the usual entry-level tasks for new entrants in the process. As a consequence, jobs in the US now appear to be being created (a) among the relatively unskilled and the uneducated, (b) are being wiped out within the middle class and (c) are growing only very slowly at the apex of the pyramid. Computers are …..claiming work once done by people in high-paying professions. The number of computer chip designers, for example, has largely stagnated because powerful software programs replace the work once done by legions of logic designers and draftsmen. Software is also making its way into tasks that were the exclusive province of human decision makers, like loan and mortgage officers and tax accountants. Some years ago…. the economists David Autor, Frank Levy and Richard Murnane argued that this was the wrong way to think about it. Computers, they pointed out, excel at routine tasks, “cognitive and manual tasks that can be accomplished by following explicit rules.” Therefore, any routine task — a category that includes many white-collar, non-manual jobs — is in the firing line. Conversely, jobs that can’t be carried out by following explicit rules — a category that includes many kinds of manual labor, from truck drivers to janitors — will tend to grow even in the face of technological progress. Manufacturing, as Krugman points out, hasn’t got many more assembly-line jobs left to lose. However, a lot of white-collar work currently done by well-educated, relatively well-paid workers will soon be mechanised – a development that will build upon the job attrition being carried out deliberately at present within the New Zealand public service, and which is taking the job prospects of many of our current crop of university graduates down with it, including jobs in science that the government was touting as essential, only a year ago. This same process will ultimately roll on here through the private sector as well – much as New Zealand employers tend to be rather slow in investing in new technology to drive productivity gains. Blame this tight fistedness on our small population, and on the pre-dominance of small businesses that can neither afford nor readily generate the economies of scale from making such investments. In this case it may only delay the process of job destruction. Once, only manufacturing workers needed to worry about competition from overseas, but….research by my Princeton colleagues Alan Blinder and Alan Krueger suggests that high-wage jobs performed by highly educated workers are, if anything, more “offshorable” than jobs done by low-paid, less-educated workers. 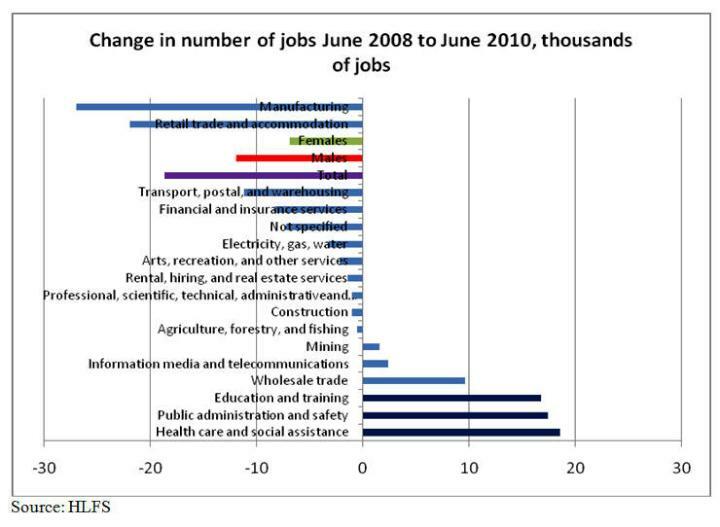 If they’re right, growing the international trade in services will further hollow out…..the job market. The usual mantra is that new growth will be generated by these budding global trade pacts in services, and the benefits will eventually trickle down to us all in time. Such faith is touching. It seems more likely that they will usher in a further hollowing out of local, white collar jobs. Even at best, Egypt’s former Finance Minister Youssef Boutros-Ghali was cited in Business Week’s February cover story on youth unemployment as bringing up a rather crucial drawback – for a prolonged period, he said, the first fruits of growth go to those who are already wealthy. Still, the competition is getting intense out there. The number of new university degree holders each year increased in New Zealand between 2000 and 2009 by 35%, from 14,663 to 19,857. 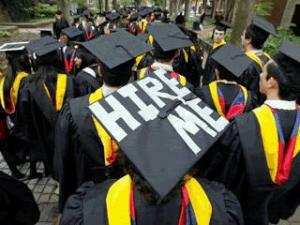 There is a growing interest in so-called ‘ ‘graduate outcomes’ – ie. 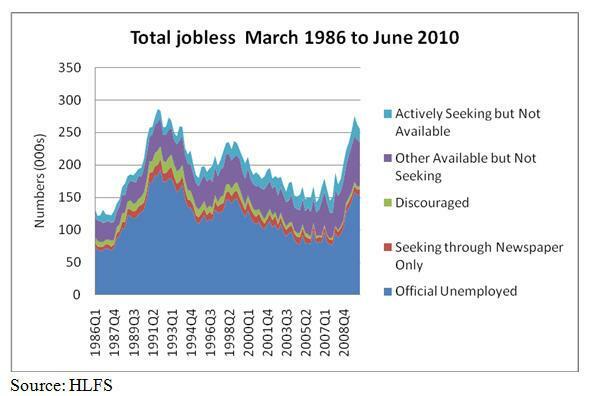 jobs and earnings – and not only by the individuals concerned. Trouble is, there is a dearth of quality information on the subject in New Zealand. The old Universities Vice-Chancellors report on graduate employment – a dubious snapshot carried out in years gone by – has now been discontinued and replaced by what promises to be a really good longitudinal study to be run out of Otago University. Tune in sometime around 2016, when that’s finally up to speed. Otherwise…I can’t claim to have summarized this literature in an exhaustive way but the Labour Department Skills Challenge Report that I referenced earlier does carry a table ( p 22) that shows a 1.3 times earnings advantage for those with a university degree as compared to those leaving school with only upper secondary qualifications. 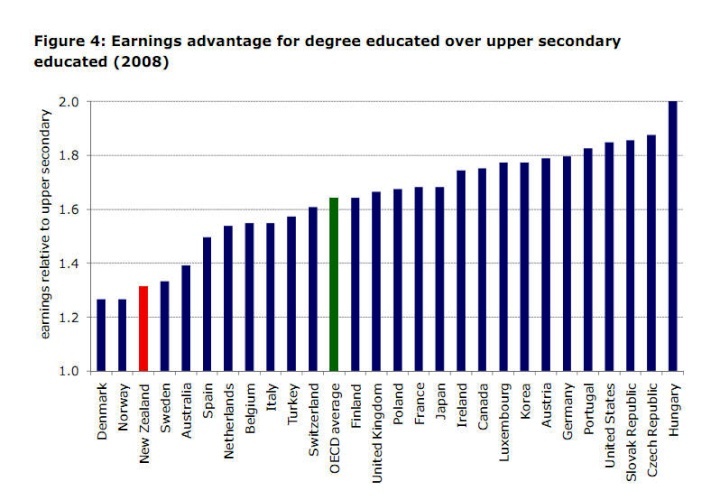 This is the third lowest earnings advantage for higher education among the entire OECD. 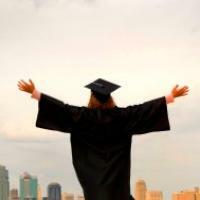 In money terms, this has been quantified – with several caveats – by David Scott in a study called “ What Do Students Earn After Their Tertiary Education ?” carried out for the Statistics and Education Departments. It is available here. Scott and his team analysed the outcomes for the age group who finished their various qualifications (everything from school leavers to Ph.Ds) in 2003, and who began earning during the relative boom years mid decade. Thankfully for all concerned, he found that higher qualifications do result in higher earnings. Just how much higher is the question. On table 10 (page 24) for instance, Scott records that in the three years after completing study, the median income of those with bachelors degrees rose from $33,000 to $41,300 – an income rise of $8,300 spread over three years. (Those qualifying with only a diploma saw their median income increase from only $24,700 to $31,900 during the same 3 year period.) Obviously though, this is merely one part of the investment equation for many students. For many people, the net value of that bachelor’s degree would need to be measured against the repayment costs of what could well be a three year undergraduate student debt. All the more reason perhaps, to head overseas, to OECD countries that deliver a bigger pay-off for higher education. Contrary to the xenophobic rhetoric from New Zealand First, this country receives a ‘brain gain’ from migration – since, according to the Skills Challenge Report (page 15) incoming migrants are more likely to have higher educational qualifications than the locally born Kiwis heading overseas to greener pastures. Inevitably though, that exodus will include some of our most expensively trained young graduates, only some of whom will return. By last estimate, about 500,000 Kiwis are living overseas. Figure 6. International comparision of additional earnings from higher education – from the Skills Challenge Report (pg 22). 6. Those Tricky School to Work Transitions. The fate of the NEETS – those not in employment, education or training – has exercised many politicians and commentators of late, all around the globe. In Tunisia they’re reportedly called hittistes – which is French-Arab slang for people who lean against the wall. At last count, as this excellent Press article on youth employment recently pointed out they currently comprise just under 14% of the entire 20-24 are range. (Maori and Pacifica youth also crop up among the young employed in disproportionate numbers. ) Various, largely unco-ordinated schemes exist in some parts of the country – Manakau was a pioneer – at keeping them at school and/or in vocational training or in programmes offering workplace experience. As yet, no common vision or template has emerged. “They’re all in a sense, pilot schemes,” says Canterbury University economist Paul Dalziel, who has been publicly supportive (in the Press article and to me) of one such scheme operating at Linwood High School in Christchurch. The [earnings] premium….varies with the type and level of qualification. [Crichton’s] research has also found that people who completed industry training qualifications at NQF level 4 and above, had improved subsequent earnings and employment outcomes, while those completing level 1-3 courses experienced no improvement, indicating no earnings premium. In 2009, people aged 15 to 24 with level 1 to 3 certificates and level 4 to 7 certificates or diplomas continued to enjoy an earnings premium over people with school or no qualifications…. The common ground – such as there is in this field – suggests that keeping at-risk kids at school or in workplace training will eventually improve earnings ( and with it, the chances of escape from poverty) only among relatively high achievers. For the rest, a year or two more at school is likely to be only be a holding action at best. While this may be the only form of rescue mission currently available, it – again – underlines the limitations of seeing education alone as being the resolution of the NEETS situation. Only structural change in the economy – to create more and different jobs seems required. Society will be paying a substantial cost one way or another. Worldwide, the revival in the apprenticeship system has been a recognition of its value – and as mentioned, the Economist cited Germany’s backing for its apprenticeship system as enabling it to survive the recent hard times with lower ratios of youth unemployment than its OECD neighbours. Here in New Zealand by contrast, funding for apprentices flatlined and the level of new entrants was allowed to plummet. It is hard to look at the funding arc for apprenticeships and avoid the conclusion that the current government has been dragging its feet here. Between 2005 and 2009, there had been an explosive growth in apprenticeships, reflected in a reported 46 % increase in apprenticeship funding in real terms between 2005 and 2009. Yet only .5 % of that 46% real increase in funding occurred in 2009, and there was a 27% fall in new entrants once the recession arrived. 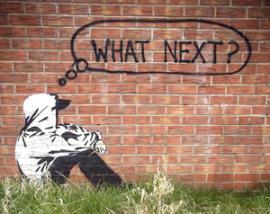 Again, the young were left largely to fend for themselves, while the policy focus went onto the tax cut programme. Canterbury University’s Dalziel welcomes the better integration that now evident between the school-to-workplace transition schemes now emerging, compared to the situation five or six years ago. Even so, there is still little in the way of national coherence, given that the responses are all essentially pilot schemes targeted at the geographical regions of highest need. Similarly, it is hardly accidental that Community Max – a scheme that offers temporary funding assistance for projects that entail community solutions to youth unemployment – is focused largely on regions in the north where Maori and Pacifica needs are glaring. Nothing wrong with that focus, when there are limited funds on the table, Rosenberg adds, but – to him – it also highlights the inadequacy of the response as a whole. Social Development Minister Paula Bennett has been very keen to point out that the percentage of Community Max participants reverting to the benefit has been encouraging – although for an idea still virtually in its infancy, it still far too early to break out the celebrations just yet. The crunch will come a few months after the first six months of initial funding has run out, and the project has had to sink or swim on its efforts. In sum, it is always tempting for governments to treat the young as being expendable. They don’t vote, they have few commitments, and most of them seem able enough to cope with whatever gets thrown their way. Here – and elsewhere around the world – the government seems willing to exploit that resilience, and be relatively complacent about its failure to provide outlets for the intelligence and creativity of the next generation. Any of the young who complain about the hand they are being dealt can expect to be treated harshly. No-one said that policies to promote growth are easy. 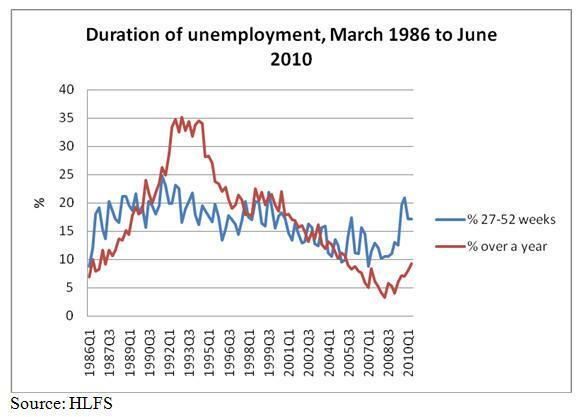 Yet clearly, the business cycle can’t be relied on to restore the previous levels of job opportunity. The contractions being wrought by new technology seem to be structural in nature. Moreover, as others have noted, an entire generation of students who have been unlucky enough to graduate in a recession risks now risk being passed over by employers as ‘ damaged goods’ once the upswing in economic activity finally arrives. Right now though, the government isn’t even actively engaged with the fallout on the young from its current economic settings. At best, the response consists of a piecemeal set of under-resourced regional programmes for school-to-work transitions and community support – while at worst, it is living utterly in denial. It appears wedded to cutting back the economy in a game of musical chairs that will leave the young scrambling to find a place in a society where for most, opportunities are shrinking. Given that the society is also ageing, it is not a sustainable plan for the future.